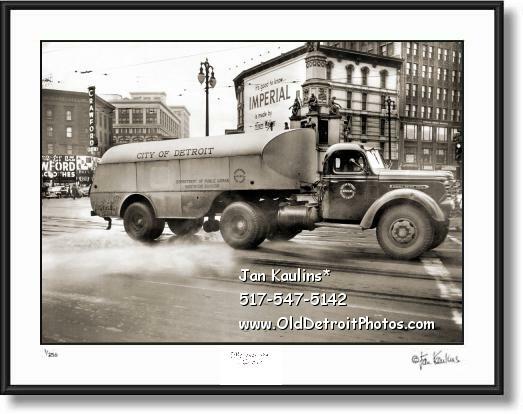 OLD CITY OF DETROIT DPW TRUCK 1949 photo picture print for sale. This vintage CITY OF DETROIT DEPARTMENT OF PUBLIC WORKS TRUCK photo picture print for sale from 1949 is a good portrait of this work truck in downtown Detroit. In the background, on Randolph Street we can see the edge of the downtown landmark Crawford Department Store. THE ORIGINAL OLD DETROIT BLACK AND WHITE PHOTOGRAPHS HAVE BEEN PROFESSIONALLY RESTORED DIGITALLY BEEN RE-MASTERED AND ALL MAJOR FLAWS, SUCH AS TEARS, SRACTCHES, MISSING PIECES, FOLDS, INK STAINS ETC. ON THESE RARE PHOTOS HAVE BEEN PAINSTAKINGLY REMOVED AND CORRECTED AND HIGH QUALITY PRINTS OF THESE HISTORIC RARE DETROIT BLACK AND WHITE SEPIA TONED PHOTOS ARE NOW OFFERED, FOR THE FIRST TIME, ON THIS WEBSITE WWW.OldDetroitPhotos.COM . THESE OLD DETROIT PHOTOS FOR SALE HAVE BEEN BEAUTIFUL RESTORED AND ARTISTICALLY SEPIA TONED AND OFFERED IN A LIMITED EDITION OF INDIVIDUALLY PRINTED PHOTO PRINTS. THEY ARE READY FOR DISPLAY IN YOUR HOME OR OFFICE. HERE IS YOUR CHANCE TO OWN AND ENJOY SOME VERY SPECIAL AND UNIQUE DETROIT PHOTOGRAPHIC HISTORY.